Unity v2018.2.20f1, Oculus Utilities v1.32.0, OVRPlugin v1.32.0, SDK v1.33.0. Oculus appear to be shifting focus towards putting assets inside the Avatar plugin dlls accessible via CAPI class, and removing some meshes, etc from individual use. Also helping raise the star rating is the inclusion of LeftControllPf and RightControllerPf which are essentially standalone animated prefabs of the Oculus Touch Controllers, used by attaching them under a customised TrackedRemote prefab, setting Controller var to LTouch/RTouch, dragging the ...ControlPf prefabs to replace both Model vars, adding those "Touch" TrackedRemote prefabs for each of OVRCameraRig or OVRPlayerController's LeftHandAnchor/RightHandAnchor sub GameObjects..
Also new are the social/network sample scenes under Oculus/Platform/Samples. - it appears to be an internal function of the Oculus.Avatar.CAPI class, of which we only can see headers, because it is an API inside the OVRPlugin. Unfortunately that does not help developers who need lightweight high performance/low overhead code for mobile platforms, like Gear VR which I am attempting. Importing ONLY the VR subtree hierarchy from this unitypackage works for SOME scenes which have no platform or avatar code dependencies, but if you start using certain prefabs or scripts, a web of cross-dependencies on the AudioManager,Avatar,LipSync,Platform,Spatializer,VoiceMod subtrees will soon emerge, necessitating a monolithic import of bloat, even if you remove the various 'Sample' subtrees. - both also designed for earlier versions of Unity, in order to test locomotion/teleport/rotation as well as UI interaction, but that brought additional complexity because of differing versions of OVR scripts in the sample scene prefabs which are incompatible with the same named scripts in the separate Oculus/VR/Scripts hierarchy. It also bears repeating to say Unity UI Navigation must be disabled on all in-scene UI components to avoid the 'stuck focus' bug, (selects the previous UI element on click rather than the UI element currently being pointed to). Update: I updated the hack to be implemented via CoRoutine only on Event DropDown Clicked, rather than every frame in Update. It currently works for GazePointer and correctly switches between Controller raycasts so long as activeController for the EventSystem's OVRInputModule is being correctly set. A number of issues and lack of obvious functions here are mitigated by another unitypackage "Oculus Sample Framework" v1.31, which very handily also contains the contents of THIS unitypackage as well as all the samples in a single download. The v1.31 version Oculus Sample Framework unitypackage combines updated/tweaked Sample Framework scenes and assets for a number of scenarios, with the core OVRPlugin 1.31 & Integration contained in the separately importable Oculus Integration Utilities v1.31 package. Compared to the previous v1.30.1 of the Sample Framework, v1.31 shows an interesting migration by Oculus towards implementing separate LocalAvatar prefabs with animated hand mesh superimposed over controllers, and away from static controller mesh representations attached to the PlayerController/OVRCameraRig. Highly customisable Locomotion with Teleport is still supported in the example scene for SampleScenes/FirstPerson/Locomotion2/TeleportAvatar, but the latest PlayerController prefab in the core v1.31 Integration package already supports very basic linear motion with snap rotation (without teleport). The GazePointerRing is used as a pointer in that scene, rather than the nice Oculus Dashboard/Home ray pointer alpha shaded linerender, but you can see and copy how a straight laser linerender and a curved multisegment linerender from controller is handled via the teleport mechanism. Bug: -There are 2 audio listeners in the scene. Please ensure there is always exactly one audio listener in the scene. Basic UI interaction is also demonstrated in the Locomotion2/TeleportAvatar scene. Happy VR coding with this asset, thx Oculus. Please see the transcript for links & background info. If you're not familiar with Augmented Reality (AR), it means using a device to synchronise virtual objects into the sensory field (e.g. visual/auditory) through which we experience the real world. A key feature of AR is locking a virtual reference frame into a live camera image of either a specific image target, a 3D object, or a surface (ground plane). This reference frame becomes a stable centre point for generated 3D objects to exist such that they appear synchronised with the real world in the device's camera image. 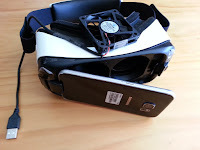 Because an AR object or image target can be tracked in 3D space, it actually provides a form of head tracking for Mixed Reality (XR) if you use a mobile Virtual Reality (VR) head mount with a camera opening such as Samsung's Gear VR or custom Google Cardboard headsets. Without head tracking, VR headsets can only provide 6DoF (degrees of freedom) rotation from a single point, and no translational movement in virtual space, adding to motion sickness. 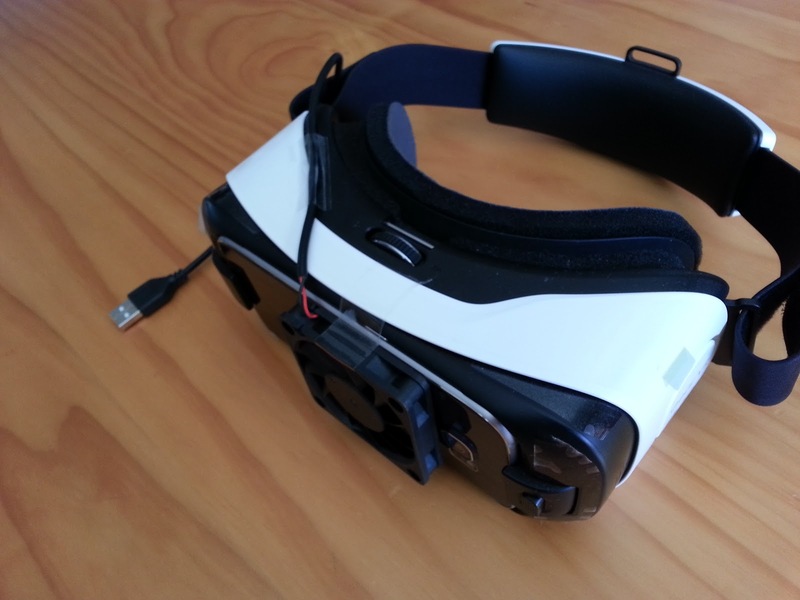 AR devices can be something as simple as a recent model mobile phone or tablet with camera. 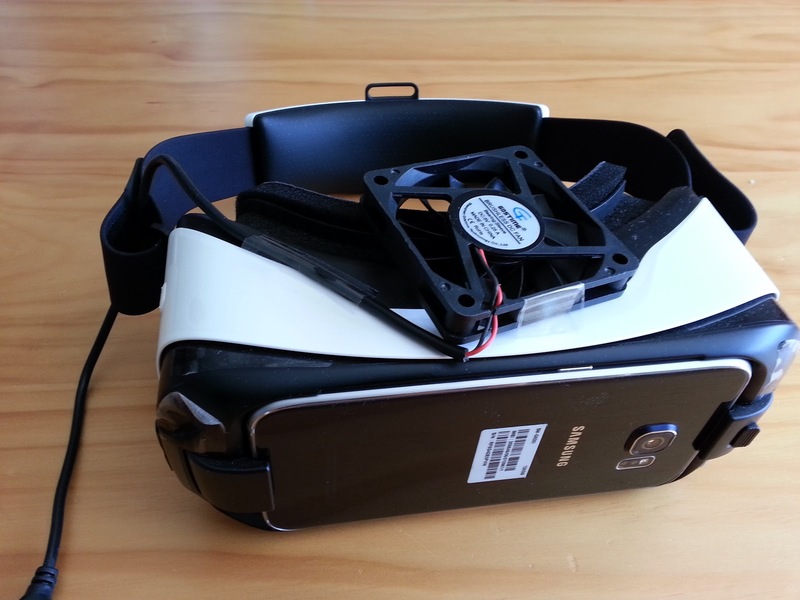 Head mounted AR devices can be more useful for hands-free operation and keeping virtual objects in the field of view, but typically there are weight and portability issues with tethered head mount devices, and image quality limitations on current untethered glass-frame devices. This video will demo 3D AR object tracking using ImageTarget & Virtual Buttons, as they are reliable and simple to implement. First up, we have the Android Studio built app, which largely contains the same feature set as the Unity app, albeit using simpler models and older image targets. The 1st Android Studio example uses the stones image target. The added 3D object is a teapot, originating from the famous 1975 Utah teapot 3D model. Using the app we can show the teapot from various distances, angles, and even zoom in on the inside of the spout, with the teapot visually appearing fairly stable against the stones image target. The image targets are printed on A4 paper from files in the supplied library, and are designed to be high contrast, with numerous well defined edges and non-repeating features. This allows detection and tracking even if only a portion of the image is visible in the camera field. The 2nd Android Studio example uses the wood background image target, with four virtual buttons. Each button gets mapped with a virtual rectangle surrounding it to detect occlusion by real world objects, effectively meaning the button has been pressed. In this case, it changes the colour of the teapot to match the colour of the virtual button covered by my fingers: red, blue, yellow, and green. Next, we move to the Unity build of the same type of example features, with image targets and non-interactive 3D objects, and virtual buttons to allow interactive 3D object behaviour using the same image targets. and an animated drone, which while small, can jitter in the hovering position above the target surface. I coded a custom 3D image of my own showing an empty gamelevel platform, using the stones image target and downloaded .xml file, but I could have used any suitable custom image with the Vuforia web xml generator. the drone emitting a blue projection field. and the fissure changing from white steam to dark red. and objects disappearing at low incident angles to the target, where feature detection is not possible. since the detection should still clearly see features of one target even if those of another become occluded or at a low angle. For further background info & links, please see the transcript for this video. And that's it, so thanks for watching! A number of books & online tutorials exist, but can be confusing due to the deprecated legacy Android Vuforia library API which used QualComm. & QCAR. naming. Now Vuforia library naming is standalone, and Android native builds require Android Studio, replacing Eclipse. However it still required significant manual tweaking and customisation for me to convert deprecated code from legacy Eclipse format into Gradle-based Android Studio framework. It is really not worth pursuing Vuforia libraries for Android Studio since the Vuforia Unity SDK makes the entire process simple and modularised, utilising drag n drop gameobjects. It is already far easier to go straight to Unity for both Augmented, Virtual, & mixed reality (XR) features. Don't bother with the downloadable legacy Vuforia library .unitypackage for Unity 5.x.x or earlier, there are too many deprecations to contend with. Aside from using the image targets from the supplied library, creating your own image targets for use in an app consists of uploading an image to your Vuforia web account, and processing them for the appropriate platform. Internally, Vuforia converts images into feature points, downloaded from the site as an xml file used in the app as a form of 2D vector UV mapping. These feature points are used for tracking in conjunction with the Vuforia image detection & processing algorithms, and any chosen 3D objects can be overlaid onscreen, locked to the detected target so that movement of the device's camera shows the chosen 3D objects from the appropriate angle and distance, matching the real world target. Google Daydream View VR requires specific compatible Android v7 phones such as Google's Pixel 2 or Samsung Note 8/Galaxy S8, but reference headsets do not allow rear camera visibility, so no AR or XR on those. Well it took a while but finally it is there for actual sale in the Google Play store, with a free demo, and a separate closed beta release for all you beta testers out there. It took this long partly due to multi-factored complications with bundle package naming restrictions. 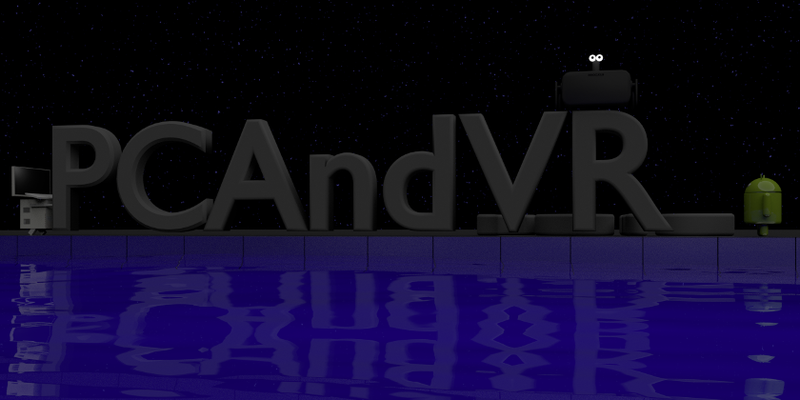 - The original beta was called com.pcandvr.marblesared. - My automated bundle naming code needed to distinguish alpha/beta/production bundles when publishing, so I couldn't leave that name as is for beta, & couldn't customise the naming just for production due to other G.P. restrictions. - Google Play lets you 'unpublish' an app bundle so that it no longer appears in Google Play to users as something they can download, but it does not let you delete the app bundle. Ever. Users who do not uninstall the app are free to continue to use that app on their devices. 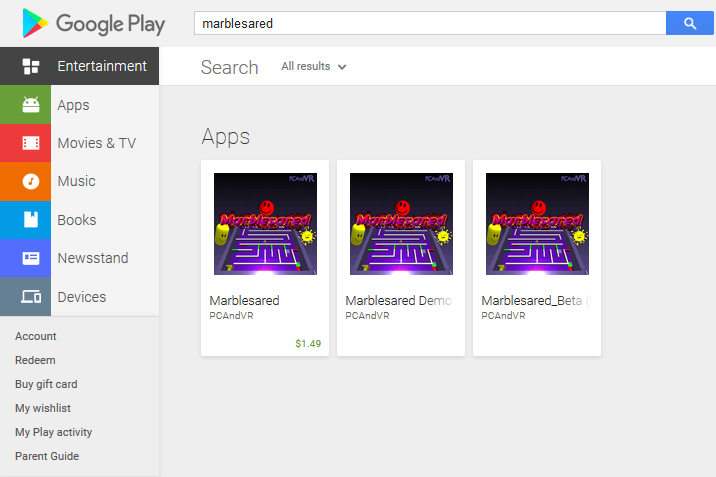 - Google Play does not let you re-use old app bundle names for new apps, even after you unpublish the old app. That is understandable - users should never face the issue of an update to an old app resulting in a different new app on their device. Both Apple & Microsoft Developer programs require payment of 100USD (150AUD) every year. Steam was a 100USD fee per title, but it was a once-off cost per title. those are additional costs I simply can't justify just at the moment - I will reconsider when I have more titles to publish, or a separate income stream to sustain that additional cost factor. I was losing enthusiasm and running out of $$$ to waste on the followup S7 & S8 and newer Gear VR headset. but I was still left with the problem of overheating, which apparently is especially bad on the Galaxy S6. I was also quite dispirited in the wallet area upon learning that Google Daydream View would require a Google Pixel 2 or equivalent latest OLED phone (like the Samsung Galaxy S8). I have read about numerous solutions specific to certain Gear VR models, and/or phone models, including clip-on fan mounts, heatsinks which required pulling the back cover and battery out of the phone, custom drilled or 3d-printed fan mounts and crazy looking aluminium foil heatsink rigs, and highly risky frozen coolant gel packs strapped to the phone (these people don't understand the concept of condensation occurring even outside a sealed cold gel pack, simply due to ambient humidity). I decided the best & safest route was a very simple air-cooling solution with a fan small enough to fit just inside the gear vr faceplate, but not too small that airflow would be insignificant & ineffective. 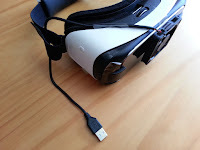 Being powered by the same usb connector as the gear VR itself would be nice but I decided against attempting to pull apart the headset for fear of irreversible damage. which can also be a mains-powered play-without-moving-too-much solution. 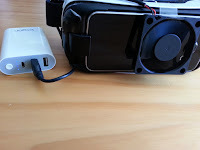 there is also no hardware dependency on the Gear VR headset - it works just fine on my old Innovator Edition SM-R321 model. For the mains powered option, I got a dual-port USB mains adapter with at least 2A output on each port. The official Samsung USB 5V @ 2A mains adapter seems to be the only thing which actually puts the S6 into 'fast charging' mode. 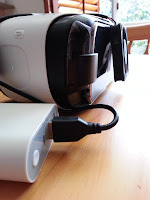 I wanted this solution to be VERY simple & easy to mount/dismount the phone from the Gear VR headset, and to plug/unplug the power source. I also wanted the power source to be mounted on the headset somehow but the lightest power packs were too low on the mAh rating, and the best power-per-buck vs low weight tradeoff got me a 6600mAh pack which even at 216g was still a bit too heavy to consider strapping to the actual headset, especially if I wanted to avoid neck strain and/or lie back on a pillow or lounge. 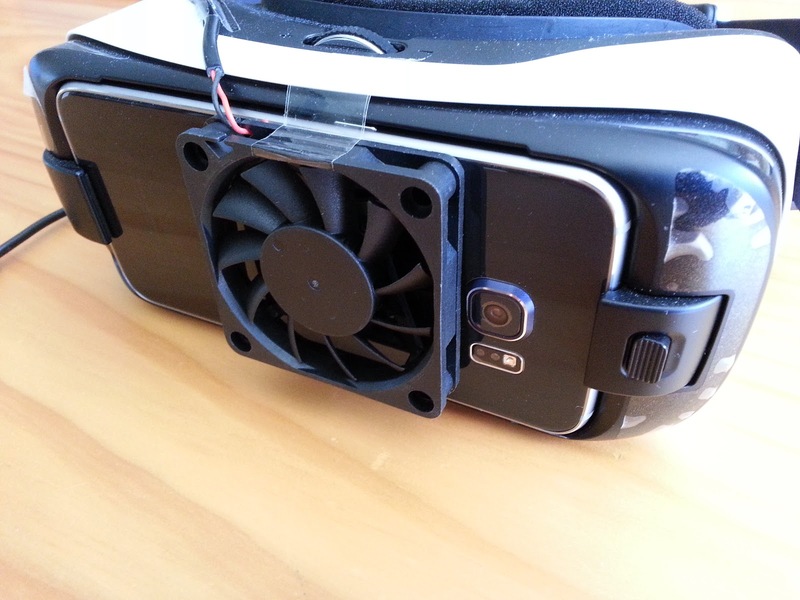 Since the overheating on the Galaxy S6 occurs primarily just under the camera lens, I positioned the fan so it would hang down just below the lens protrusion with the S6 mounted, and swing back up over to rest on the top of the Gear VR when unmounting the S6. 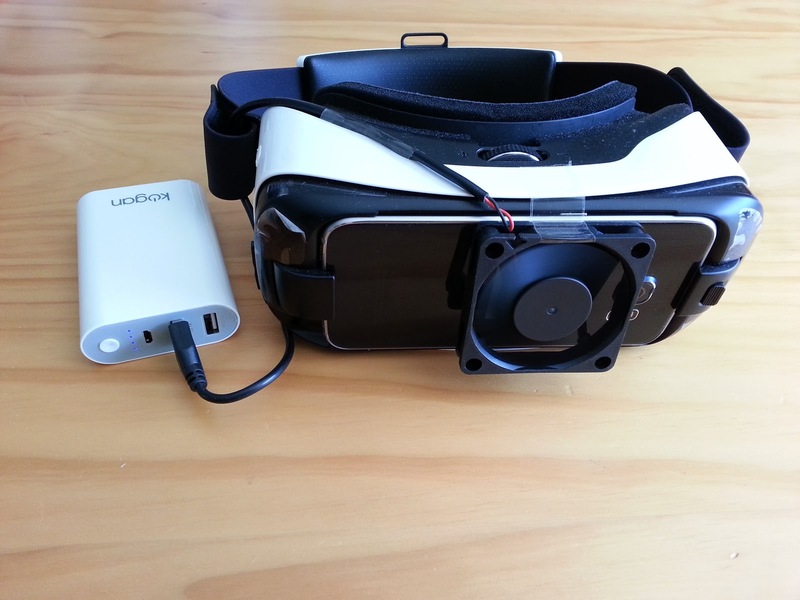 And here's the result, giving endless VR playtime, no overheating, cool-to-the-touch even after one hr solid play (eyestrain prevented further testing). You can see in the side-on shots, the spinning fan pushes itself away from the phone face, which is fine, since that allows the airflow to disperse across the phone backplate for more effective thermal displacement. Also the CPU/GPU limit on phones doesn't allow the same level of detail you can generate with nVidia GTX high end cards. 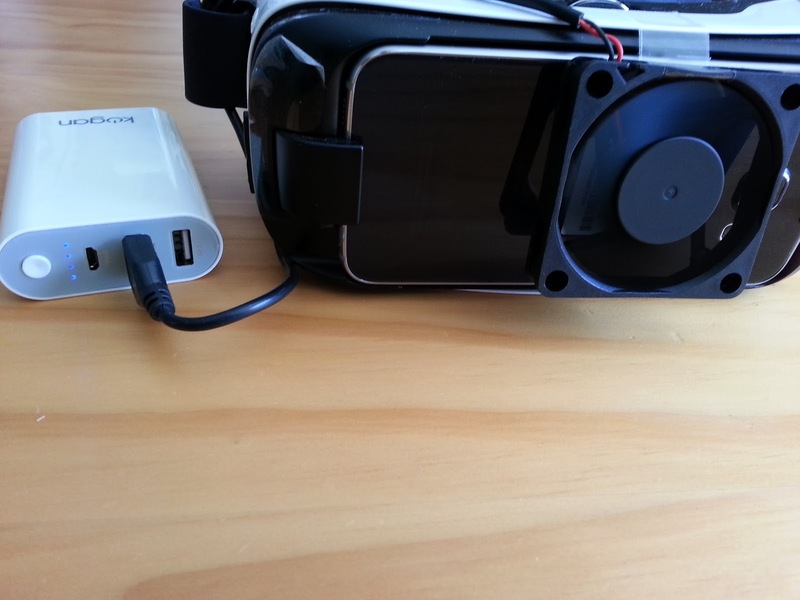 I only have a GTX 970 & Intel 3770K and they are perfectly adequate for Oculus Rift VR. Here is the All-Hallows Eve edition 31/10/2017 build of "Marblesared" (Marbles Are Red) for PC and Android. Otherwise it is available on Steam, itch.io, Facebook Gameroom for USD2.99. Free Demo version with 6x4 levels x skills rather than 33x4 also available. Marblesared has been [Early] Released on Steam today for the Windows PC platform! If anyone wants a Steam key for the PC version, lemme know, you deserve it for being beta testers. You don't need a Steam key for the Android platform, it is still sitting in free beta mode for now in Google Play. the question of build stability is up in the air. Microsoft Win10 / Universal Windows Platform (UWP) builds & MS App Store remain a pipe dream, even tho normal windows 32bit builds work just fine on windows 10. This is an early draft of a game trailer I am planning for Steam Direct Early Release. Many thanks to the brilliance of Edvard Greig for his 1875 work "I Dovregubbens hall" (In the Hall of the Mountain King) as performed by the Czech National Symphony Orchestra, commissioned by Musopen as public domain, found on wikimedia.org.